The Kuwaiti Maritime Museum first opened its doors to the public in 2010, after the old Sharqia School was converted into the museum’s current structure. For those who are interested in learning about the country’s maritime history before the discovery of oil in the 1930’s, this museum is one that you will definitely not want to miss, as they really strive to preserve the past and educate the public on Kuwait’s maritime industries. While Kuwait may be known for being an oil-rich nation, oil was only discovered in the 1930’s. Before this, the country consisted of a thriving community of pearl divers and fishermen, but this maritime industry was laid to rest after Kuwait’s oil reserves were found. While there is still a bit of maritime industry that occurs around the country, this is continuing to significantly decrease over the years, making the Maritime Museum one of the best spots to visit to learn more about the area’s unique history. The Maritime Museum is split into ten different sections, each one exhibiting various artefacts that relate to Kuwait’s maritime history. As soon as you arrive at the museum, you will notice the large dhows and small tools that are displayed outside, followed by plenty of photographs of fishermen at work. A popular exhibit within the museum is the one on pearl diving, which used to be one of the main trading activities amongst locals. In addition to the bags of pearls and pearl products here, you will also see several reference books and documents that explain pearl diving in further detail. 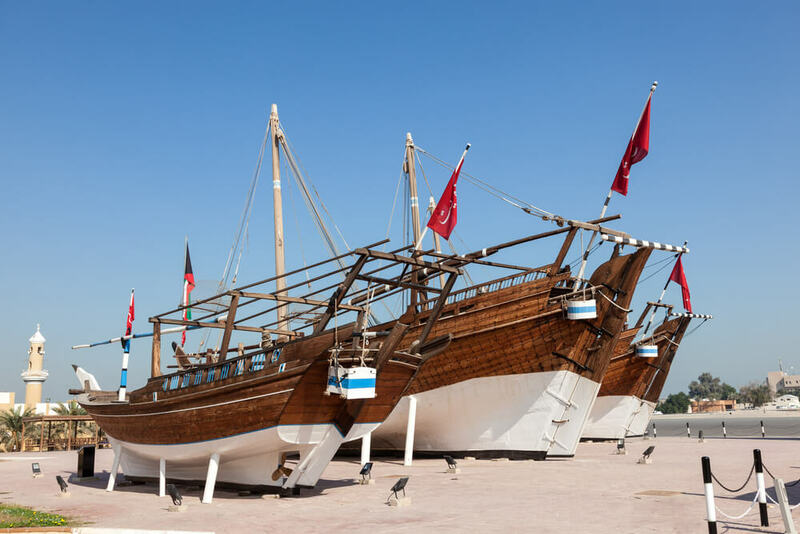 Dhows are traditional boats that were frequently used by fishermen and pearl divers, and the Maritime Museum has quite a few different ones on display. Some of these boats were created specifically for pearl divers, while others were built for other purposes, and it is truly fascinating to see the differences between each of these vessels. There are some dhows here that used to be used to transport water to the residents of Kuwait City, before desalination plants made running water possible, and the story of how this used to work is one worth listening to. If you still have some time to spare after visiting the Kuwaiti Maritime Museum, it would be worth heading over to the Modern Art Museum, which is just a stone’s throw away. This museum consists of two floors with five exhibition halls, and features everything from contemporary sculpture to modern paintings. The Kuwaiti Maritime Museum is open every day of the week apart from Sundays, although the opening hours do vary between days, so it would be advisable to check these before planning your visit. Try to allocate at least an hour for your visit, and be sure to remember to bring your camera. Whether you are interested in maritime industries in particular, or just want to know more about Kuwait’s background, you will no doubt find this museum an inspiring one to explore.